Unable to deny the science any longer, the state of Pennsylvania has just approved the use of marijuana to fight off the ever-increasing opioid epidemic. Making illegal or banning arbitrary substances does nothing to curb their use. In fact, as the increasingly deadly opioid crisis illustrates, it makes matters far worse. What does help to foster improvement, however, is when the state reverses prohibition. The most recent state to figure this out is Pennsylvania, who just added opioid addiction to the list of conditions for which it will allow people to obtain marijuana. Of course, total legalization would be ideal. However, this move by Pennsylvania lawmakers shows that the science can no longer be denied and bureaucrats have to finally admit it. “We have expanded the number of serious medical conditions to include neurodegenerative diseases, terminal illness, dyskinetic and spastic movement disorders and opioid-use disorder,” Pennsylvania’s Secretary of Health, Dr. Rachel Levine, wrote Marijuana.com in an email. As Marijuana.com reports, Levine said that while medical cannabis won’t necessarily be the first or only substitute for other more established treatments in opioid recovery, marijuana may prove to be a viable option for some. “We’re making medical marijuana available to patients if all other treatments fail, or if a physician recommends that it can used in conjunction with other traditional therapies,” Levine said. Although this is a very limited beginning, as attorney and director of the Pittsburgh chapter of the National Organization for the Reform of Marijuana Laws (NORML), Patrick Nightingale points out, this action is going to save lives. On top of the immediate benefit to those addicted to opioids, adding marijuana to the list of approved drugs for opioid addiction also “enables research to be carried out on medical marijuana’s effectiveness in treatment opioid-use disorder because only approved conditions can be studied through our research program,” according to Levine. Indeed, after this move, the Pennsylvania Department of Health has approved eight Pennsylvania universities as Certified Academic Clinical Research Centers that will “help shape the future of treatment for patients who are in desperate need not just here, but across the country,” Governor Tom Wolf recently announced. This research will undoubtedly help to add to the ever-increasing mountain of evidence showing that opioid addiction can be fought with marijuana. As TFTP previously reported, in a recently published study in a peer-reviewed journal, Melvin D. Livingston, Tracey E. Barnett, Chris Delcher, and Alexander C. Wagenaar, set out to see if any association existed between Colorado’s legalization of marijuana and opioid-related deaths in the state. The researchers looked at all of the available data from the year 2000 to the year 2015. What they discovered may come as a shock to many. While the rest of the nation struggles with a burgeoning fatal opioid and heroin overdose crisis, the State of Colorado saw opioid deaths reduced while its population exploded. It’s not just that study either. There were other studies showing that deaths from opioids plummet in states with legal cannabis, and that 80 percent of cannabis users give up prescription pills. A Feb. 2017 study confirmed that opioid dependence and overdoses dropped significantly in medical cannabis states. In January 2017, the National Academies of Science published an exhaustive review of the scientific literature and found that one of the most promising areas in medical cannabis is for the treatment of chronic pain. 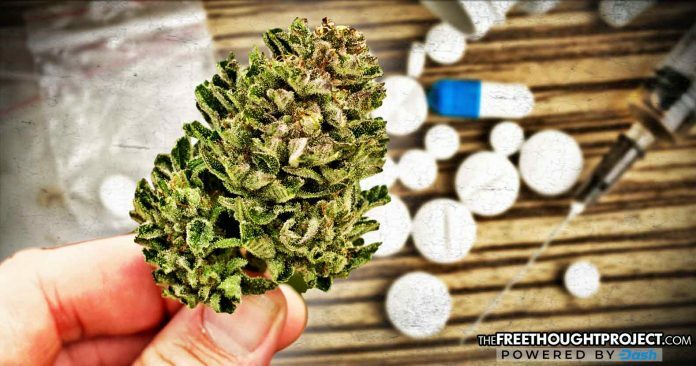 As TFTP reported last year, a new experimental study showed exactly how cannabis works to treat actual opioid addiction – by actually blocking the opioid reward in the brain. Those who continue denying the evidence, while continuing to lock people in cages for a plant, will ultimately be judged by history. They will not be the heroes they claim to be now, however, they will be remembered as the ones responsible for mass incarceration, fostering the police state, and dealing a near-death blow to freedom.